On January 19, in the main event of the UFC’s first card on ESPN+, UFC bantamweight king TJ Dillashaw will drop down to the flyweight division to battle divisional champ Henry Cejudo for his belt. 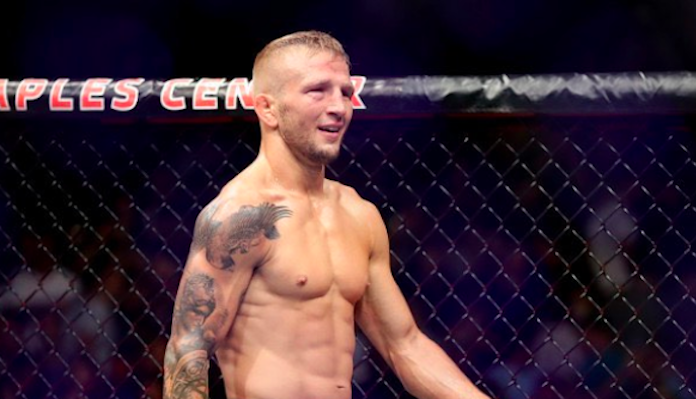 First, however, TJ Dillashaw will have to successfully cut down to the flyweight limit of 125 pounds. Henry Cejudo’s manager Ali Abdelaziz has doubts that that will happen. He expects Dillashaw to miss his mark, in which case Cejudo will apparently not accept the fight. Instead, Abdelaziz says, Cejudo will give a short-notice title shot to long-time flyweight contender Joseph Benavidez, who has been pegged as an alternate for the fight. Replying to a fan on Instagram recently, TJ Dillashaw responded to these doubts from Ali Abdelaziz. Apparently, he’s currently closer to the 125-pound flyweight limit than he normally would be to the 135-pound bantamweight limit at this phase of his fight camp. 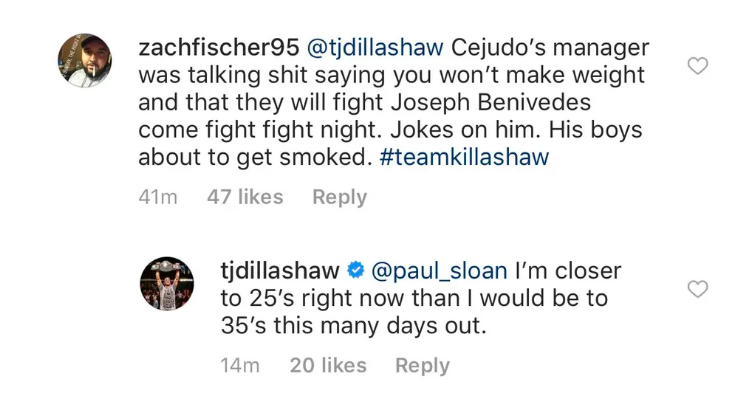 “I’m closer to 25’s right now than I would be to 35’s this many days out,” Dillashaw wrote (h/t Reddit user Mmastradamus). Do you think TJ Dillashaw will successfully hit the flyweight limit for his fight with Henry Cejudo?